One of Texas' most challenging - long, tough holes (one 700') and short tricky ones. Big and beautiful, bordering the Guadalupe River. 9-Mach3/9-Discatcher. Alt. contact; Wallace Hall (214) 475-4821. (Original layout was John Houck's 3rd design, but there have been many changes since). The 1st of 2 courses at the park. 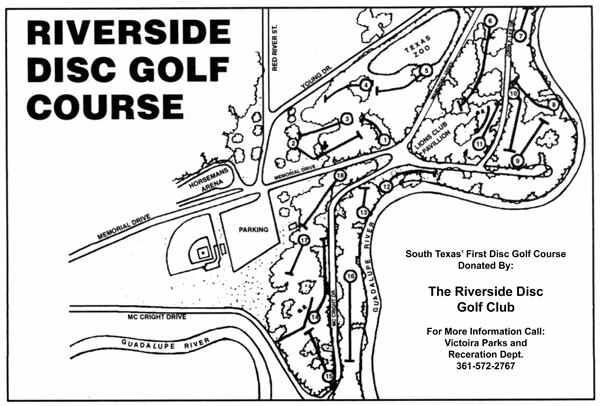 Play the 9-hole River Course after #17 for a 30 hole round. From Hwy. 87 (Main St.), west on Red River into the park, left on Memorial. Park in lot across from restrooms. Basket #1 at intersection of McCright and Memorial. Scorecards at Parks Dept. by rose garden on other side of park. Very nice course. The grass was well maintained given this was a rainy time of year. Lots of large pecan trees to navigate through and around but they all well maintained. Most of the holes are long so bring your A game with some power because you'll need them. The river is in play on some holes so be careful or you'll belong to the "donation" club. The signage was ok, you might get lost going to the next hole so download the map or hook up with some locals for help.